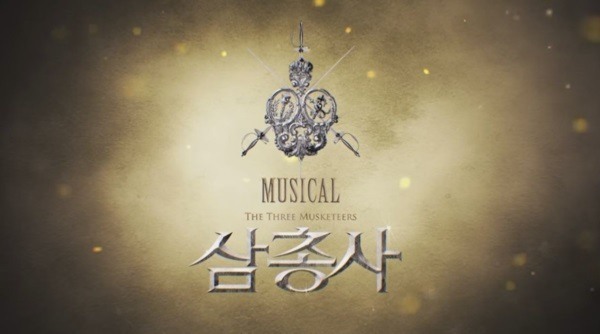 Based on Alexandre Dumas’ novel “The Three Musketeers,” the musical rendition of the classic tale is returning to the Seoul stage. The story revolves around the adventures of D’Artagnan in his quest to become part of the elite three musketeers -- Athos, Porthos and Aramis -- in the backdrop of early 17th century France. The original Broadway production first opened in 1928 to rave reviews. “The Three Musketeers” musical finally made its local debut in 2009, where it ranked No. 1 in performance ticket sales. Since then, the hit-production has been staged more than 300 times across the nation. Now the show returns to the Seoul stage for the first time in two years, this time with a much younger set of male leads. This year’s production will feature K-pop idols CNU (24) and Sandeul (24) of B1A4, along with ZE:A’s Park Hyung-sik (24) and opera singer-turned-musical actor Kai (34), all playing the role of D’Artagnan. “To me, we are not just playing the roles of musketeers, but through the blood, sweat and tears that we have dedicated to this production, I feel like all of us actors really came together as one and became true musketeers,” said Park during a press conference held at the D Cube Arts Center in Seoul on Friday. While it is common practice to double or triple cast a character in big musical productions, having four different actors taking on the same role is suggested to be one of the show’s biggest character-building benefits, aside from its young cast. “It is pretty unusual to have four actors all playing the same role, but I think this makes D’Artagnan more dynamic by offering up different interpretations of the character,” said Kai. The ongoing musical also stars Kang Tae-eul, Park Eun-suk, Park Sung-hwan, Cho Kang-hyun, Jang Dae-woong, Hwang Lee-kun and Cho Yoon-young. 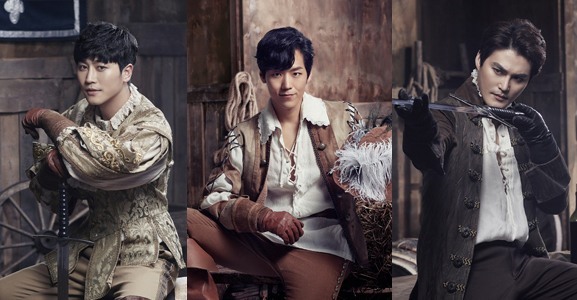 “The Three Musketeers” production will continue to be staged daily through June 26 at the D Cube Arts Center in Seoul. Tickets range from 60,000 won ($52) to 110,000 won. For more information, call (02) 764-7867.